Amid tactical assignments and the absence of creature comforts, the U.S. sailor had love on his mind. World War II. The South Pacific. Far, far away from home and the wife he longed to hold, Rich scrounged together what time and supplies he could find to make a memento. Other American service men stationed in that part of the world had made coin bracelets for their loved ones, fashioning them together with links and clasps. Rich couldn't find any links readily available, but a fellow seaman offered him a big spool of platinum. Rich declined the offer to keep the entire spool, but instead only took what he needed to craft seven oval shaped links to hold the coins together. Years later, Rich said he could have kicked himself for turning down such an offer. Platinum wasn't worth much during the 40s and so he wasn't enthused about the idea of hauling that spool around for the duration of the war. "It could have been worth so much these days," he'd say wistfully, looking at his well worn hands. 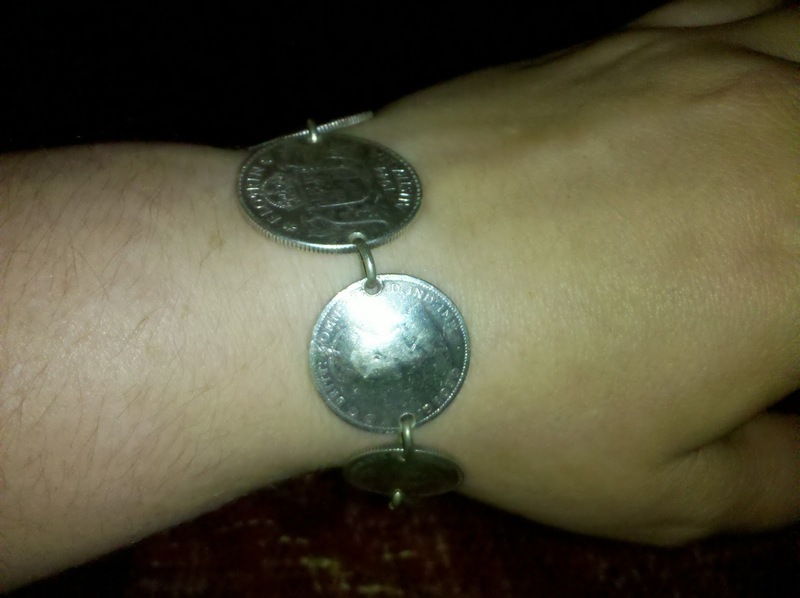 While making the bracelet, Rich hammered the smaller Australian coins into concave shapes, allowing the bracelet to naturally curve around a woman's wrist. Some of the coins, dating back to as far as 1916, held with them their own untold stories. The sailor's greatest gesture, sanding down one side of the largest, centerpiece coin and inscribing, "To My Wife Sallie With Love Rich." Thousands of miles away from home and thinking about his wife. Thinking about the reasons why so many American servicemen were at war. Rich returned home to Sallie, safe and sound, and went on to start a family. Through the years, he volunteered and marched in parades with a Youngstown American Legion post, proudly wearing pins and other remembrances of his service. Rich went on to spend his twilight years as a loving grandfather to three girls, the oldest of which was precocious, curious and clever. 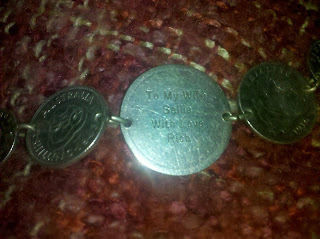 She admired her grandmother's bracelet as a girl, posing for photos with its coins dangling off her tiny wrist. Years later, she wears it as a woman. And she knows her grandparents are proud. Thank you to the many service men and women who continue to commit themselves to the Stars and Stripes. We are truly indebted to you. 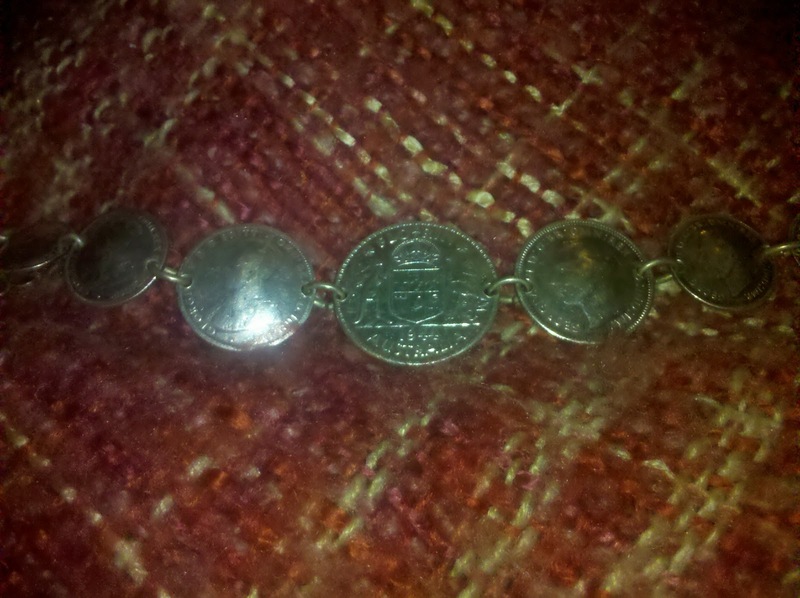 Some of the coins that date back to 1916, he organized their stories told.